Each spring I eagerly await the arrival of rhubarb at the local market. 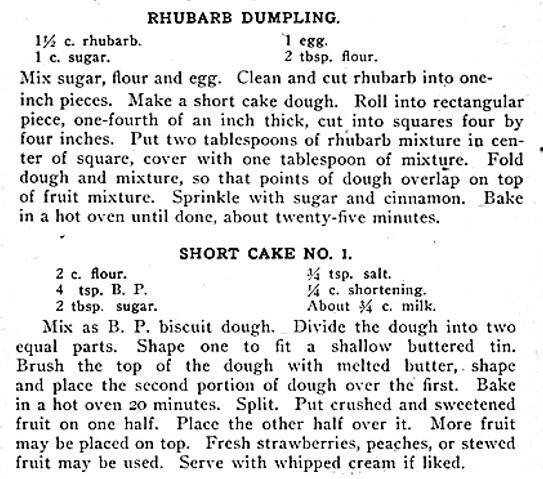 I bought some rhubarb last week-end, so I was thrilled to find a hundred-year-old recipe for Rhubarb Dumplings in a hundred-year-old cookbook. The Rhubarb Dumplings were tender with a refreshingly tart rhubarb filling embedded in a sweet custard-like sauce. Preheat oven to 425° F. Put sugar, flour, and egg in a small bowl; stir to combine. On a pastry cloth or other prepared surface, roll shortcake dough to 1/4 inch thickness; cut into squares, 4-inches by 4-inches. Put heaping 1/8 cup (2 tablespoons) in the center of each square, then cover with 1 tablespoon of the sugar and egg mixture. Fold dough so that the points overlap on top of the rhubarb mixture. Put the dumplings in a large flat baking dish, about 1 inch apart. Sprinkle with sugar and cinnamon. Bake for 25 minutes or until lightly browned. If desired, serve with whipped cream. In a mixing bowl, combine flour, baking powder, sugar, and salt. Cut in the shortening; then add the milk. Stir gently with a fork to create a dough. The old recipe only called for 1 1/2 cups of rhubarb. When I made this recipe, I had difficulty measuring 2 tablespoons of rhubarb for each dumpling. (Rhubarb is just too thick to fit well on a spoon.) So I used a 1/8 cup scoop, and put a heaping scoop of rhubarb in each dumpling, I ended up running out of rhubarb before I’d used all the shortcake dough, so I cut up an additional stalk of rhubarb. I think in the end that I used 2 – 2 1/2 cups of rhubarb. The dumplings were excellent, though if I made them again, I might put even more rhubarb in each dumpling. Posted on May 13, 2018 May 13, 2018 by SherylPosted in FoodTagged dessert, recipe, rhubarb. Oh, yum! These look like a lot of work but the payoff sounds scrumptious! Making dumplings is somewhat time consuming, but I had fun doing it. I’m not so fond of rhubarb (and good, fresh rhubarb’s hard to find here), but these dumplings look wonderful. I’m already pondering which fruit I’ll try them with. hmm. . . maybe peaches or cherries (and of course apple dumplings are always wonderful). what an awesome looking dessert, and I absolutely love Rhubarb. Definitely going to give this a try & additional cherries sounds like bliss! I think that you’ll enjoy this recipe. I love rhubarb and I love shortcake, so I am sure I would like these. If you like both rhubarb and shortcake, I think that you’d enjoy these dumplings. My rhubarb is in winter recess but I think this recipe might work well with feijoas which are plentiful at the moment. Feijoas is a new fruit to me. I just googled it, and it sounds wonderful. I love rhubarb!! Thanks for sharing this. Thank you! It’s wonderful to hear that you liked this recipe. I have never had rhubarb. I think the thought of it being a vegetable always freaked me out. This recipe makes it sound good, though! Rhubarb is quite tart, but I really like it. You should give it a try. You make my mouth water! I truly need to find some rhubarb! I’ll keep my fingers crossed that you are able to find some. I can’t wait for rhubarb season! It should be coming soon! This recipe looks so delicious! I made rhubarb pies and crisp every spring, but have not tried dumplings. I haven’t made any rhubarb pies yet this year . . . maybe next week-end. These look delicious. I shouldn’t have looked while hungry and still over an hour away from lunch break! My rhubarb is ready to pick! Thanks! I think that you’ll like this recipe. Yummy dumplings. I haven’t had rhubarb in decades. Sounds wonderful. Rhubarb is one of those old-fashioned foods that I really enjoy. My rhubarb is about 6″ high. Should be big enough in a couple weeks to try your recipe. Did you know that rhubarb plants can live 100 years?! Last year I was looking for a rhubarb jam recipe and the only ones I found had other fruit (strawberries, oranges etc.) or jello in them. Don’t know how far back I would have to go to get a pure rhubarb jam recipe. However, after some experimentation, I came up with one that’s pretty good. Wow, I had no idea that rhubarb plants can live so long. I’m going to have to look and see if there are any hundred-year-old rhubarb jam recipes in my old cookbooks. I don’t think that strawberry-rhubarb recipes or the ones with jello were around a hundred years ago – though the only rhubarb jam type recipe that I’ve ever made for this blog was called Pineapple and Rhubarb Conserve and contained pineapple, oranges, and rhubarb. I almost didn’t read the recipe because I thought “rhubarb dumplings?? eww”. But I am glad I did. See I was thinking dumpling like the things you drop into hot soup or stew to cook. We would probably call those rhubarb dumplings a turnover here. They look tasty. Our rhubarb is coming up, all leafy growth so far. We grow a lot of rhubarb…one of our main crops. The word “dumplings” apparently has several meanings. The kind that go into soups and stews, and the fruit kind. 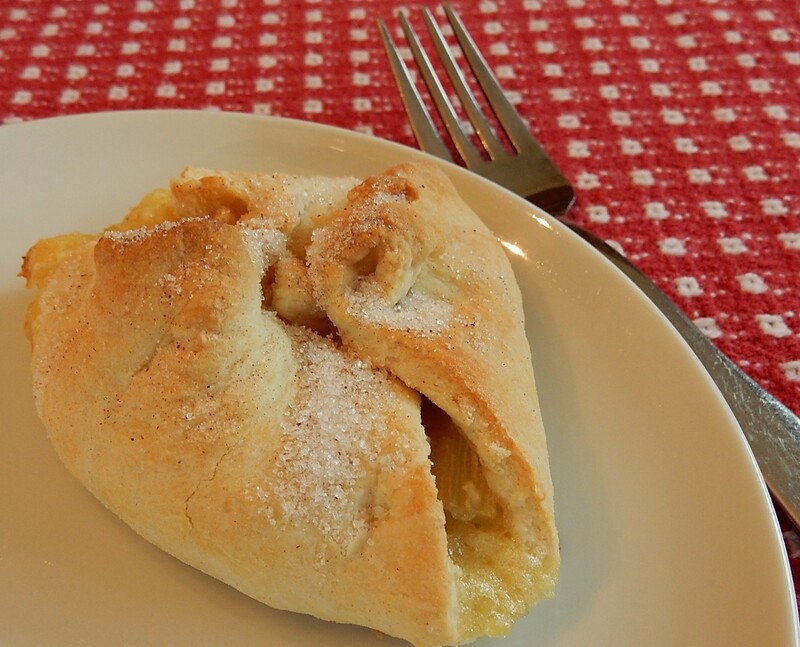 These are similar to apple dumplings.